I thought I would share this with you. Decorative Concrete Supply in Lenexa had a great write up about staining concrete in a recent newsletter I got. Enjoy!! Concrete stains, both reactive (acid stain) and non reactive (water based), enjoy wide spread popularity among designers and home owners. Whether you are veteran professional applicator or a first timer, understanding the basics is vital to achieving good results. Let’s review the four basic steps to staining, and the proper procedures for each. Almost all stain problems can be eliminated by following these steps. 1. 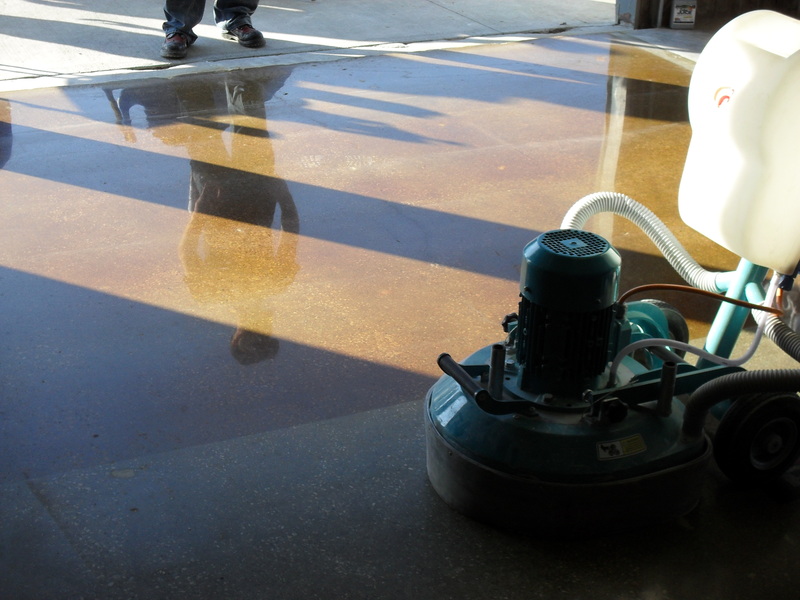 Surface preparation: Understanding what the concrete is going to do once the stain is applied is very important. Proper surface preparation can save you a lot of headaches down the road. A simple water test (spraying water over the surface and observing what happens) is always recommended, and tells quite a bit about the porosity of the concrete and the ability for the stain to wet out and react. Look for dry spots or beading of the water. If the water does not soak in evenly, additional prep may be necessary. Dry sanding, chemical degreasers, and mineral acid cleaning are three common methods of cleaning or opening up the surface for better penetration. Conducting a moisture-vapor emission test is also a good idea at this time. This will measure how much moisture vapor is being emitted from the slab. Too much moisture could inhibit stain penetration. You can find out more about moisture testing by talking to one of the sales professionals at Decorative Concrete Supply. 2. Stain application: Applying the stain is actually the easiest of the four steps. Most stains provide a coverage rate of 250 to 300 square feet per gallon. Avoid over application, which can create surface tension or buildup, especially on less-porous concrete surfaces and when using darker stain colors. I recommend applying the stain using a good quality sprayer. It can be a pump up type or a pressure type; the critical thing is that you have a good quality tip that sprays evenly, and does not “spit”. Make sure to apply even thin coats, with two coats usually being sufficient. With acid stains, allow a minimum of 5 hours of dwell time between applications. If using a broom or scrubber to work the stain into the concrete, remember to work out any broom marks and/or streaks. 3. Neutralizing and washing: This is the most misunderstood and overlooked step of the four, especially when acid staining. To better understand the importance of neutralizing, think of it this way: By applying an acid stain, you take concrete from a basic pH state to an acid state. You need to return the concrete to a basic state, while removing any unreacted stain and stain residue. Simply put, this step involves a good old-fashioned cleaning and scrubbing with an alkaline soap that can break down stain residue and neutralize the surface. Using water by itself is not enough. Once again, using a broom or walk-behind scrubber makes the job easier. Typically, multiple scrubbings are needed, especially with terra cotta and dark brown stains. Take a pH test to make sure the surface has been properly neutralized. Then rinse the surface with clean water and allow ample dry time before sealing. Using water based stain makes the job much easier since there is not acid to neutralize, just make sure any remaining residue has been removed. 4. Sealing and maintenance: The final step is to apply a sealer to the stained floor, to keep it looking and performing its best. However, if the project is an interior application, sealing by itself is not enough. It’s important to use a sealer system, which includes a base-coat sealer and a sacrificial topcoat sealer, or wax. In the next edition we will discuss sealing after staining in detail. Even when you follow all the steps outlined above, variations can occur. That’s why you should apply a sample of the stain for all your staining projects. This is the only way to get a good idea of what the stain will look like. For more detailed staining guidelines, consult with the stain manufacturer, or the sales professionals at Decorative Concrete Supply. Just a quick post to talk about how polished concrete applications and how perfect they are for basement floors. Many people want to utilize the existing concrete of their structure, but don’t know how. The current and up coming trend is to polish the existing concrete. Currently many companies, us included, are staining concrete and putting a clear top coating on. While this is achieves a great look we are trying to push customers into polishing their existing concrete mechanically. This is achieved by using successive grits of diamond pads and usually involves 10 plus steps. This achieves a high, maintenance free product. By the way…colors can be added. It seems we have run into a lot of basements that have flooded with all of the rain we have had here is a quick video showing how we overlay and stain basement floors. An overlay isn’t always necessary, but better assures a real nice looking stain outcome. Basement Flooring Kansas City – Stained Concrete? The heavy spring rains are back and unfortunately a lot of people are having their basements take on water. People are sick of carpet and looking for a better solution. Stained concrete basement flooring is highly popular and relatively inexpensive. (we usually are around $4/sq foot for a basic stain) and if you feel like doing it your self let me know…i have a consulting program to guide you through: floor prep, where to buy materials, techniques, and proper sealers. Water ruined your basement’s carpet? How about stained concrete! The rain has taken a toll on the basements around the Kansas City metro that is for sure. Our ground is currently super saturated and it looks like it isn’t going to stop. We hear many people with carpet that has gotten wet and is ruined. Now what do you do? 1st, tear it out and throw it away of course, I’ve always thought that carpet in a basement was kind of nasty anyway for the most part. Many are turning to stained concrete as a solution for their moisture problem. The concrete can be simply cleaned, stained, and top coated with a sealer. A couple of throw rugs and you are good to go.